Last Sunday the weather conditions were not good. HOWEVER all members but one of the choir made it to church. Our member living furthest east - Brian Mullahy, was present. Our member living furthest west - Lorraine Gallo was present. Saturday, Feb.21 3:00pm "Portrait of a People"
Sunday, Mar. 15 4:00pm Book Study. Miss Jordan's many solo performances include concerts with the Long Island Philharmonic at the Tilles Center of the Brahms Requiem, and the premier of Ray Shattenkirks, The Flower Kissers. Early solo appearances include Radio City Music Hall and the Saratoga Spa Music Theater. 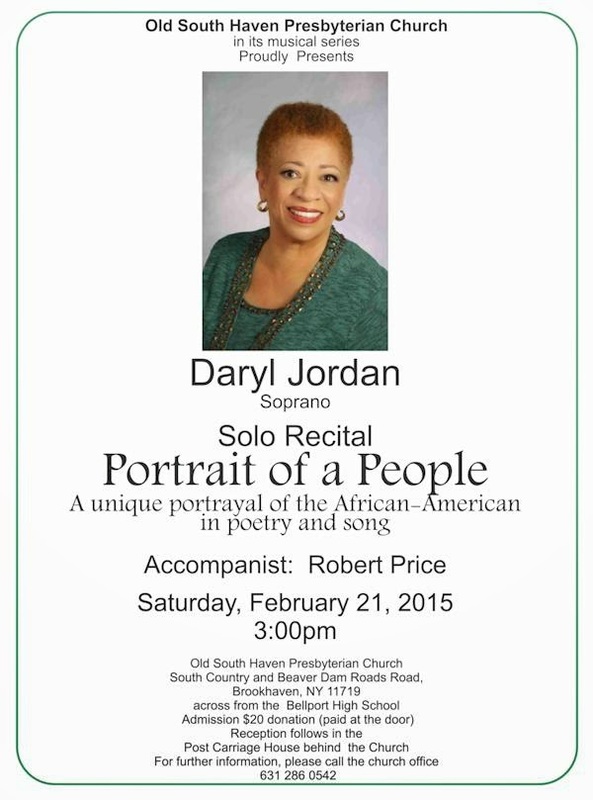 African American compositions are included in many of Miss Jordan's recital programs. 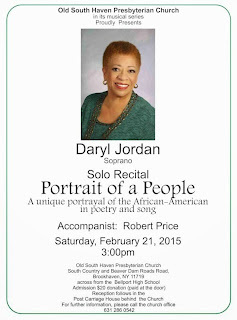 She conceived "Portrait of a People", as a solo recital of poetry and song by African American poets and composers. A highlight is the presentation of this recital in Lenna Hall at the famed New York State's Chautauqua Institution's Summer Festival. That year Chautauqua awarded a "Daryl Jordan" scholarship to a college voice student who showed outstanding ability in both music and drama. Other performances in the Northeast of this recital include the Long Island Heckscher Museum, University of New Hampshire, SUNY Potsdam, where she was accompanied by the distinguished American composer Arthur Frackenpohl, and the Bay Street Theater in Sag Harbor. Miss Jordan resides in East Patchogue with her husband Herman Washington. Printable flyer visit http://OldSouthHavenChurch.org/Events/Portrait.pdf .